HALLMARK 2008 PONTIAC FIREBIRD ~ This ornament is a repaint/colorway of the 2005 Classic American Cars #15 - which was issued in a sporty blue/turqoise color. This car is seen as a classic white with red interior paint scheme. Die-cast metal, wheels turn. 4" wide. 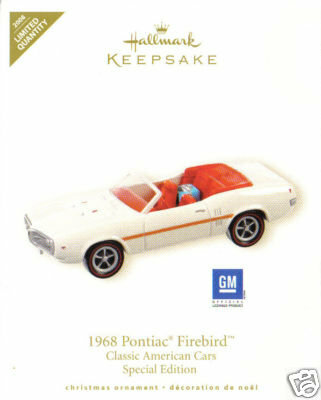 Items Similar To "2008 Hallmark 1968 PONTIAC FIREBIRD Classic Car Repaint / Limited..."